Soompi, DramaFever, Korea Boo, HanCinema... If you are a fan of Hallyu(Korean Wave), you might have heard of them and even added them on your favorite list to keep up with Korean pop culture and latest updates on Korean pop stars. Editors who create contents for these web sites have been getting their job done greatly with high level of interests in Korean culture. However, in many cases, they have never been to Korea despite of the close relation of their work with the country, which often leads to lack of understanding on Korean culture. Accordingly, the Korea Foundation for International Culture Exchange(KOFICE) invited representatives of 15 K-pop media from 9 countries around the world to Korea. 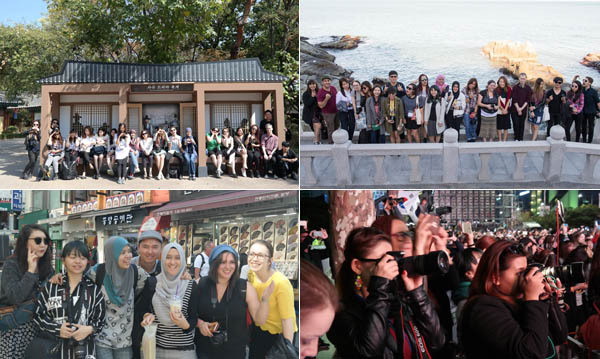 These overseas online opinion leaders had a chance to tour around Seoul and Busan during their 9 nights 10 days trip from September 30 to October 9 and communicate with their SNS followers in real time, being eyes and ears on behalf of Korean Wave fans out there.